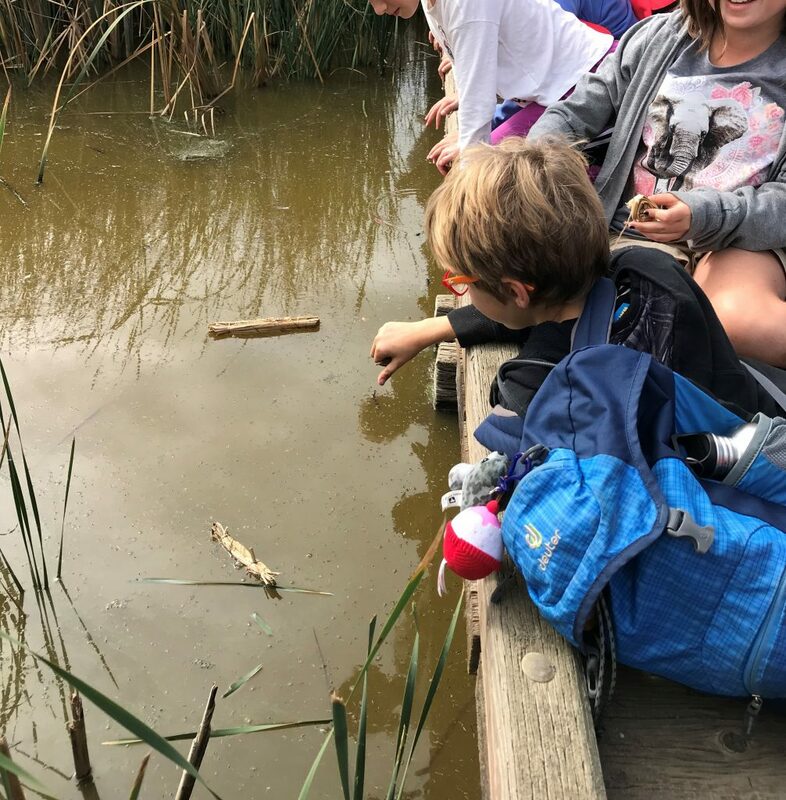 In this article you will read about the IB Primary Years Programme (PYP) and Reggio Emilia approaches in action at an Italian language immersion school in the USA. The article illustrates how a constructivist student-led inquiry can provide students with the opportunity to ask meaningful questions about real-world issues and find answers to those questions through meaningful inquiry and hands-on learning tasks. Our school’s mission is to “inspire brave learners to shape the future” through our unique combination of the Reggio Emilia philosophy, the rigorous IB framework and Italian language immersion. We embrace the Reggio Emilia philosophy of education for a variety of reasons. The approach honors the whole being and also holds a holistic “image of the child”—the physical, intellectual, emotional and social. Students are also understood as leaders and active protagonists in their learning, and teachers are viewed as facilitators and researchers who provoke student learning and help students generate their own hypotheses and theories. The approach also invites students to intrinsically develop the courage and confidence to further recognize their unrealized potentials. We offer a unique and complementary marriage of the IB continuum of international education and the Reggio approach to honor and celebrate student-centered, constructivist, and inquiry-based approaches. At their core, both recognize learners as active participants in their own learning. The Hundred Languages of Children, written by Loris Malaguzzi (the founder of the approach), emphasizes the importance of celebrating the many intelligences children possess, ways that they can express themselves, and different ways to be and know in this world as they embark on learning journeys and quests for meaning-making. The metaphor of the hundred languages of children supports a truly transdisciplinary approach to education. The IB learner profile attributes and key concepts complement and support the Hundred Languages in that they highlight dispositions of expression that allow for student intelligences to shine while encouraging international-mindedness and cultural relativism. Our grade 4-5’s inquired into the central idea that “our rights and responsibilities as citizens impact the formation of our identities” with “who we are” being its transdisciplinary theme. Teachers intentionally kicked off the school year with this unit to provoke students to begin thinking that there are multiple ways of seeing and being. The key concept of “perspective” was interwoven during inquiry into Malaguzzi’s Hundred Languages poem. 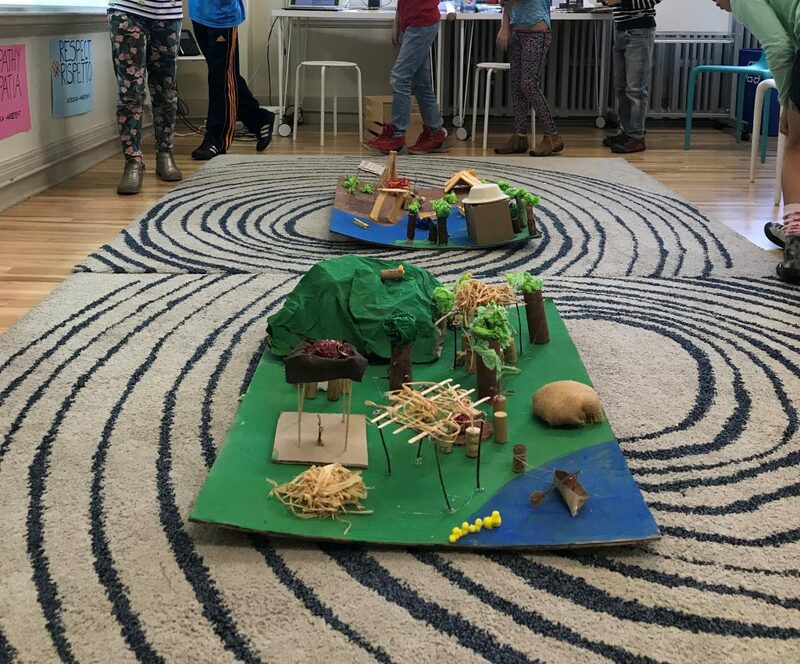 This provocation activated student-initiated inquiry into their rights and responsibilities of members of their local classroom, school, and neighborhood communities as well as inquiry into similarities and differences that they share with students from other parts of the world. Students noticed that they shared more rights and freedoms in the United States than some grade 4-5 students from other parts of the world. They discovered that in some countries young people do not have the right to attend school. They were able to ultimately understand that, on a local and global scale, individuals and societies have a plethora of perspectives and ways of knowing that can serve to offer them deeper insight into the richness of cultural diversity. At the end of this unit one student proclaimed that “an understanding of cultural beliefs that are different than ours will help us become a more peaceful global community”. This and many other students displayed the learner profile attributes and international-mindedness while endeavoring to gain further intercultural understanding of the rights of young people. La Scuola’s “ateliers” (art, digital, environmental studies and tinkering studios) also embrace the Reggio approach and more concretely showcase constructionism in action, in a project-based manner. Similar to Reggio, students are invited to explore and utilize natural and recycled materials to build and create artifacts that demonstrate their learning. This enables students to be active participants in their learning in new and exciting ways. The Reggio model highly values project-based and inquiry-based learning, and celebrates the process—and not only the product—that may become manifest at the end of a project or transdisciplinary unit. The continued referencing and application of the PYP concepts throughout the course of each of the six transdisciplinary units can allow for yearlong Reggio style projects to take place. Grade 4-5 students are currently using the key concepts to make links between the units they have inquired into thus far. After learning about rights and responsibilities in their first unit, students applied the concepts of connection and responsibility when deciding to investigate the rights of refugees and of ways that they can take action and support members of Central American Migrant Caravans (Viacrucis del Migrante) in their second unit on migration. In their current unit on creating and responding to art, students are analyzing and creating art pieces that showcase the perspectives of migrants and refugees whose rights are violated. Students are seeing that their six transdisciplinary units do not really come to an end but are a yearlong inquiry project or puzzle with each piece representing one of the six transdisciplinary themes. Parallel to the IB, our Reggio inspired students tackle big ideas (similar to central ideas and lines of inquiry found in the IB) that are problematized and inquired into in a transdisciplinary manner. When observing a classroom at La Scuola, it may often be difficult to recognize the subject or discipline being taught as a given project may involve provocations or moments of inquiry that highlight language, art, mathematics, and science at the same time. In a grade 3 unit on indigenous peoples, for instance, students were challenged to recreate indigenous mathematics games. This was a project that required them to learn words from indigenous languages that describe the game pieces, understand the mathematics involved in order to teach and play the game, and then sketch and create the game pieces using their many competencies/languages in art. 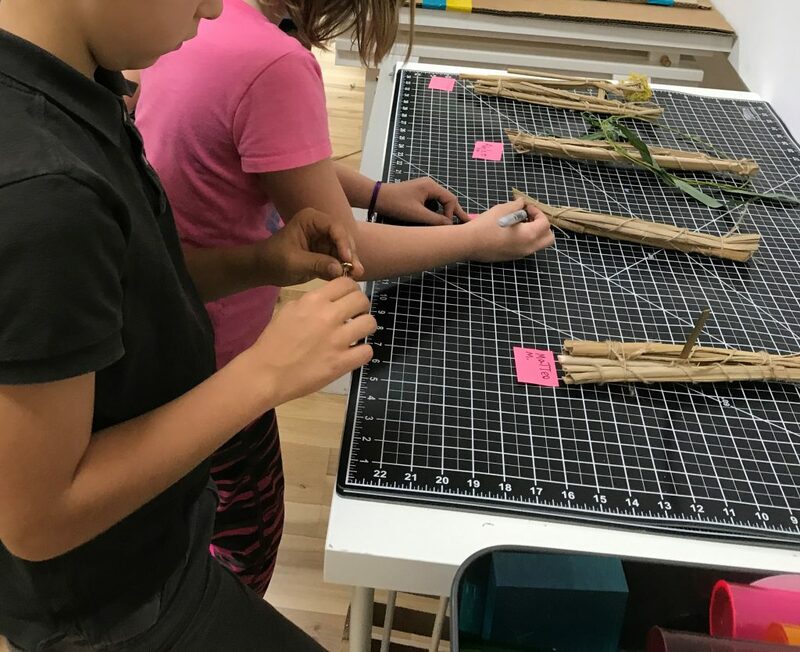 During the same unit, students were inspired by the Ohlone peoples to create their own versions of tule boats and at the same time unpacking the key concept of form while measuring out their materials using mathematics skills. Students then floated their boats on what used to be Ohlone land. After embarking on a field trip to Coyote Hills (formerly Ohlone territory), students used natural materials to create a replica Ohlone village as a final project which gave them the opportunity to showcase their knowledge and understanding of Ohlone ways of knowing and being. The inquiry-based and transdisciplinary nature of our programme, premised upon the IB framework and Reggio approach, gives students a unique advantage and ability to handle situations they are unfamiliar with and to become critical and thoughtful consumers of information. It allows for students to thrive in different environments and to better adapt to challenging situations with curiosity and an eagerness to ask difficult questions, and create innovative solutions to current world problems. It also encourages collaboration and open-mindedness—skills that are critical for success in the 21st century. 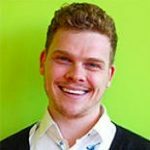 Michael-James is a grade 4-5 teacher at La Scuola International School in San Francisco, California, USA. He has been teaching within the IB Primary Years Programme framework for nearly six years. Prior to working at La Scuola, he taught in the PYP at Bilingual European School in Milan, Italy. Michael-James’ Reggio Emilia inspired, inquiry-based, constructionist and constructivist approach to teaching seeks to motivate young people to discover and celebrate their own unique gifts and capacities as agents of action and change. Michael-James welcomes feedback, collaboration and further dialogue via Twitter @MaestroPalazzo. Thank you for publishing this intriguing, informative and inspirational article! innovate combination will, hopefully insure thee continuous progression of thee human race. Thank u so much for thee opportunity to view such efforts.